Thanks to everyone that stopped by during AQUAMAN WEEK here at Once Upon a Geek. Based upon comments and number of hits, it seemed to be of interest to lots of folks. I’m glad to hear that. Today is an addendum to AQUAMAN WEEK. Below you will find a picture of my Aquaman figures. I don’t buy every Aquaman figure that comes out, but I do have quite a few of them. My collection includes the original Mego Aquaman, the Super Powers Aquaman, Total Justice/JLA Aquaman figures, some HeroClix, a JLA PVC of Aquaman, DC Direct figures, a Mattel DC Universe Classics Aquaman, a Super Friends Aquaman, a custom figure built by a friend, and many more. Click the picture to enlarge the image. Kind of a funny story… Shortly after Aquaman lost his hand and replaced it with a hook in the comics, a friend and I were discussing DC action figures. 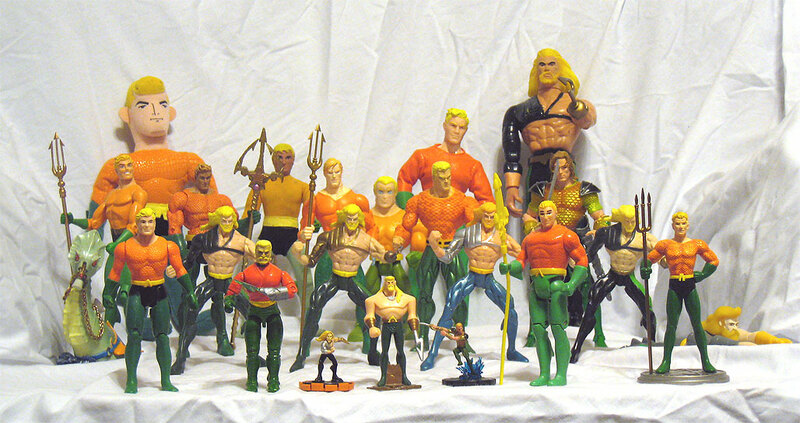 The idea of an Aquaman action figure with a hook came up. I was convinced that DC would never produce such a figure, and yet I wanted one really badly. I figured DC wouldn’t make a hooked Aquaman action figure for two reasons: (1) Aquaman wasn’t very popular, so why make an action figure at all; and (2) the concept of piranha eating your hand and then replacing it with a sharp hook seemed a little out there for a kids toy. During this discussion my enthusiasm got the better of me and I said, “Dude, if they made an Aquaman action figure with a hook, I’d buy like twelve of them.” Well… along comes the Total Justice action figure line. It just so happens that they made an Aquaman with a hooked hand. My friend was kind enough to remind me of my enthusiastic statement. Being a man of my word, I bought twelve of the action figures as you can see below. The four in the front represent the four variant versions there were. In the front row, the far left figure was the standard Total Justice Aquaman. The back two rows are also the standard Total Justice Aquaman. In the front row, the far right figure was the standard JLA Aquaman (only real difference from the Total Justice figure was the pants had black instead of dark green). Again in the front row, the second from the left (with the gold shoulder pad) was the variant edition from the Total Justice line. Finally, in the front row, the figure third from the left (with the silver shoulder pad and blue pants) was an oddball repaint from a series only sold at WB stores. So I guess I was crazy for sticking to my word and buying all these figures. However, I was smart and waited until the toyline was dying and they were on clearance. I may be a man of my word, but I’m not a fool with my money. Long live Aquaman, king of the toybox! … says the man who runs the AQUAMAN SHRINE. We are all worried about you. This obsession is not right. Now, if it was Hulk figures, that would be cool. And manly. Ha, it’s like a Chippendale Dancer revue!!! its not that you own 12 of the same Aquaman figure. its that you own 12 of the TOTAL JUSTICE AQUAMAN figure!